Ashley joined us eight years ago and works in one of our two control rooms. 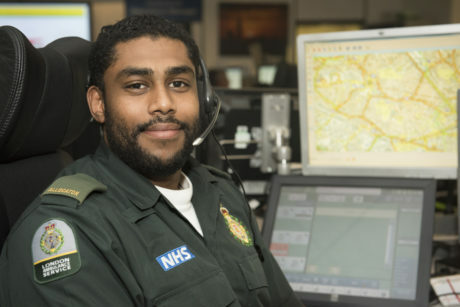 He has the tough job of allocating ambulance crews to emergencies and deciding which calls to prioritise. When I applied for a job at the Service, I also applied to work for Barclays and at a Job Centre. I chose to work for the ambulance service because it had the best career path and the best opportunities to progress. I am overseeing all the calls coming into the area and I have to allocate ambulance crews to emergencies. Sometimes I can have 25 ambulances to look after. I have to decide which calls to prioritise. How do you make a difference to the lives of patients? It can be a stressful job particularly when you’ve got child who isn’t breathing or there’s been a serious car accident. You feel like their lives are in your hands. My job is to juggle our resources – to do what’s best for the patients and for the ambulance crews, to get the best possible outcome. I started eight years ago as an emergency medical dispatcher and worked my way up to being an allocator. Now I’m aiming to be an area manager.